Sony: Anniversary PS4 Reselling Was "Inevitable"
Sony UK's Fergal Gara said that releasing a limited number of anniversary PS4 consoles was to "honor the fans," not create a huge eBay secondary market. 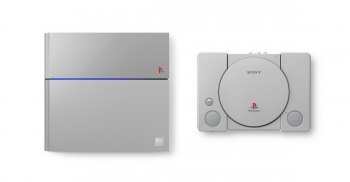 To celebrate the 20th anniversary of the first PlayStation console, Sony released an extremely limited number of PS1-themed PlayStation 4 systems. A nice gesture, certainly, if you could get your hands on one--the $500 bundles, which came with PS4 cameras as well, sold out almost immediately. They soon reappeared on eBay with ludicrously high price tags--and though Sony is none too pleased about this, the publisher also thinks it was bound to happen. "It's inevitable some proportion of that will happen, and very hard to prevent it completely," Sony UK's Fergal Gara told Eurogamer. In Europe, fans who brought PlayStation memorabilia to the PlayStation '94 shop and said a secret phrase had the opportunity to pick up one of those anniversary PS4s for less than Â£20--meaning those eager buyers are the ones making the biggest profits upon reselling their systems. "The way you get hold of one of these consoles requires some fan knowledge, so we're trying to tap into the people who love the brand the most, and put them at an advantage, because they're the people who keep us in business, who inspire this whole 20 year legacy," Gara said. Despite Sony's good intentions, Gara feels that, to some degree, the system scalping was inevitable. "You can't completely remove it, but that certainly isn't the intention of the exercise at all. It's to honor the fans and having it at such a low price to the dedicated here, it's all but free, but a nice little touch in terms of remembering the launch year." Sony will release an even more limited number of anniversary PS4s through their official channels later this month, but with only 12,300 being produced, they won't be easy to find. You might have more luck on eBay--just make sure you have a few thousand bucks to spare.